A few months ago, thegoldwater.com ran an article about the rumored ‘Muslim Internment Camps’ that China had installed in it’s Xinjiang province to fight against its Uighur population (see our related coverage) turning to Islamic extremism. At the time, there were stories about the Chinese holding up to one million people in such camps, getting them re-educated to give up their religious beliefs and uphold allegiance to President Xi Jinping instead. Related coverage: <a href="https://thegoldwater.com/news/26334-China-1-Million-Muslims-Held-In-Re-Education-Camps-Forced-To-Eat-Pork"> China - 1 Million Muslims Held In Re-Education Camps, Forced To Eat Pork</a>. For anyone who thought that those were just stories, the Chinese communist government signed such camps into law as of this morning and added a fight against any ‘halal’ products (including food and toothpaste prepared in a halal, as allowed under Islamic rules, manner) appearing in supermarkets in Xinjiang. Former detainees have reported that they were for hours upon end forced to sing songs such as "Without the Communist Party, There Would Be No New China" and any of the those who could not remember the words were not given meals. "In the end, all the officials had one key point. The greatness of the Chinese Communist Party, the backwardness of Uighur culture and the advanced nature of Chinese culture," a Uighur detainee named Mr. Abdusalam Muhemet told a Turkish newspaper. The news was met by great surprise by neighboring countries with large Islamic populations bordering Xinjiang province. 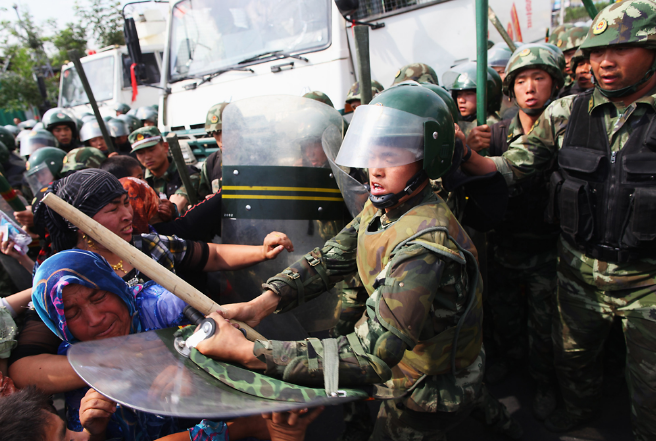 The Chinese government knows that there was, is and always will be trouble in Xinjiang province. Just as with Tibet, they have tried sending as many native Han Chinese to migrate over there but still the native Muslim population makes up over half the region’s citizens. The Uighurs have twice declared an ‘independent state in the 1930s and the 1940s, each time China overran it. Then in the 1990s, seeing the many countries around them develop into independent states after the fall of the Soviet Union, they tried again, but still, to no avail. In 2009 there was widespread inter-ethnic rioting (pictured) which resulted in 200 deaths when the Chinese government cracked down any demonstrations. In recent years, Al Qaeda and other terrorist groups have tried to forge links with Uighur separatist groups, but as the latter are nationalist first and Islamic second, this relationship didn’t move forward. The installment and admittance by the Chinese government of trying to repress Islamic culture could change all that. Singlemindedly united as one under invincible banner of Xi Jinping Ideal held aloft by Dear Leader Generalissimo Xi Jinping, brilliant statesman, political genius, and invincible military commander. We should do something similar with our invaders but with these changes. Unbrainwash the Islam out of them and replace it with respect for their new hosts and the country that offered them a gift that will benefit their families more than any act of terror would. Sad to think this way but I no longer look at Islam as a protected religion but more of a terror cult. The so called peaceful ones sure don’t seem to call out the violent ones so they have all earned the terrorist title in my eyes.